Between the prophets and Bruno Schulz, Yiddish film and Jewish social media, feminism and the Holocaust, hundreds of participants of Limmud Keshet Poland spent the weekend running from one lecture to another. Who did you hear? What did you see? Where are you going now? Where's room D? 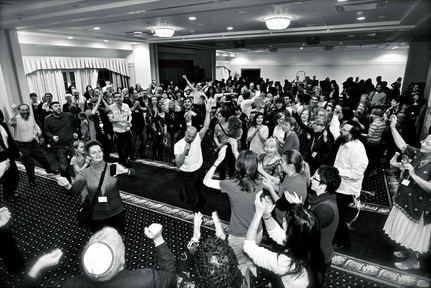 A frantic attempt to reconcile between attending as many lectures and workshops as possible and spending quality time with friends and new acquaintances – such is the nature of the Polish edition of the Limmud Conference. Limmud is the perfect illustration of what being Jewish in Poland is about - it gives ear to the plurality of voices which exist in the Polish Jewish community. And 'learning' itself is in fact the Polish Jewishmodus vivendi. Since the fall of communism in 1989, the number of Jews in Poland has been a growing one. Jews are deassimilating, or 'coming out of the closet', if you like, and it is an unprecedented phenomenon in that part of Europe. Twenty years ago, those who 'came out if the closet' and decided to pursue a Jewish identity had to learn about Jewishness mainly from American books, as Konstanty Gebert remembers. Since then, we might say that Polish Jews have reached a level of Jewish literacy which not only allows them to learn from one another – as is the mission of Limmud – but it may also inspire other Jews to begin to learn from them.